A community is a reflection of what we crave: belonging. Belonging is the heart of human connection. Our hardwiring is to be social creatures, to need one another. We cannot become our best selves without feeling like we belong to a tribe that sees us, respects us, and lifts us up. A sense of belonging can be fostered in many ways: food, music, volunteering, a cause. You can scan a room and see a diversity of backgrounds, ages, and skill sets—yet the common thread is shared desires and aspirations. It’s magnificently profound how simple this connection is, how deeply we all crave it, and how it changes the trajectory of our lives. The work of community is when a person walks into a room with fear and self-doubt, only to leave with a new narrative and a feeling of possibility and hope. We can give that experience to one another. It’s the work of being human. 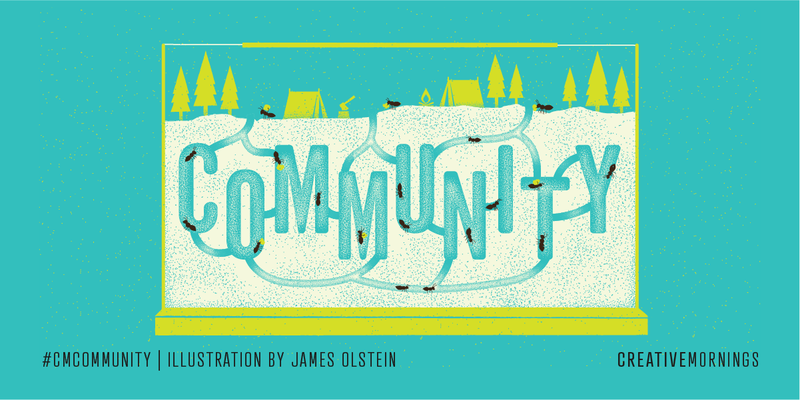 This month’s global exploration of Community was chosen by our Philadelphia chapter, and illustrated by James Olstein 👋 High five to MailChimp, Adobe, and WordPress.com for fuelling our global creative community.